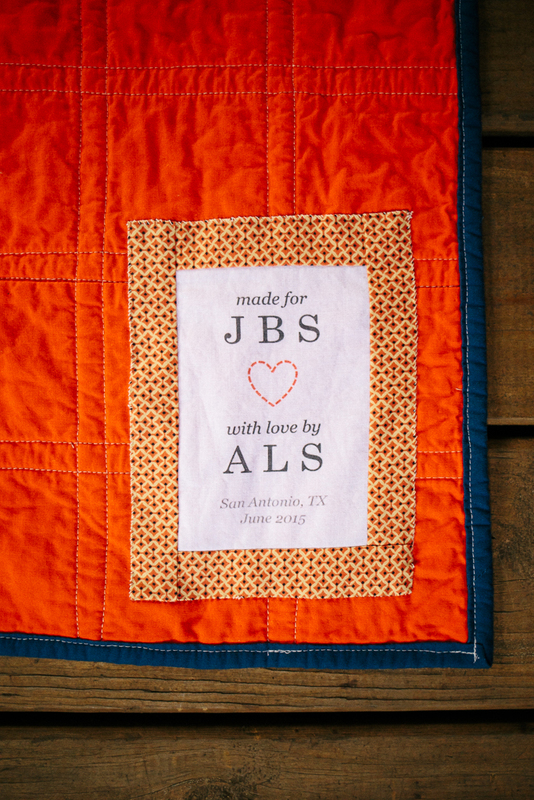 So, today I want to jump right in and tell you about Jackson’s baby quilt. (It’s been over a month since we’ve taken these pictures, and I can’t believe how much he’s already changed!!). Fabrics: Kona Cotton solids (Cloud, Delft, Navy, Indigo, Windsor, Cadet, and Snow), Kaufman Oxford Yarn Dyes in blue (although I don’t see this color available anymore), Kaufman Essex Denim, Carolina Gingham (1/8″ royal and 1″ navy), and Liberty of London Katie & Millie print in Blue. For the back I used Kona Tangerine. 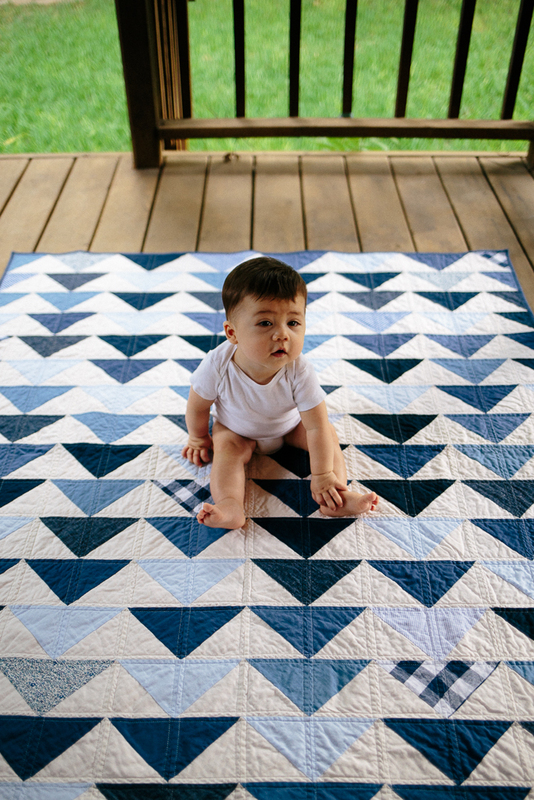 There is a long story to share about this quilt! Needless to say I think I put a lot of pressure on the whole project, and I wanted it to be just PERFECT. 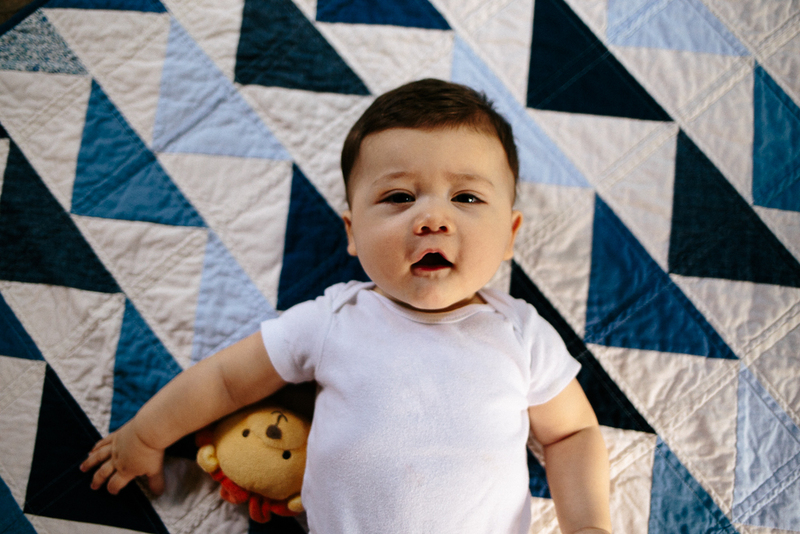 I had actually been collecting some special fabrics for a baby quilt for several years, but unfortunately I hadn’t quite settled on which pattern I wanted to use. I went back and forth with the design for several weeks. I wanted it to be traditional but not TOO traditional that it didn’t seem fresh and current. I really love Rita from Red Pepper Quilts. 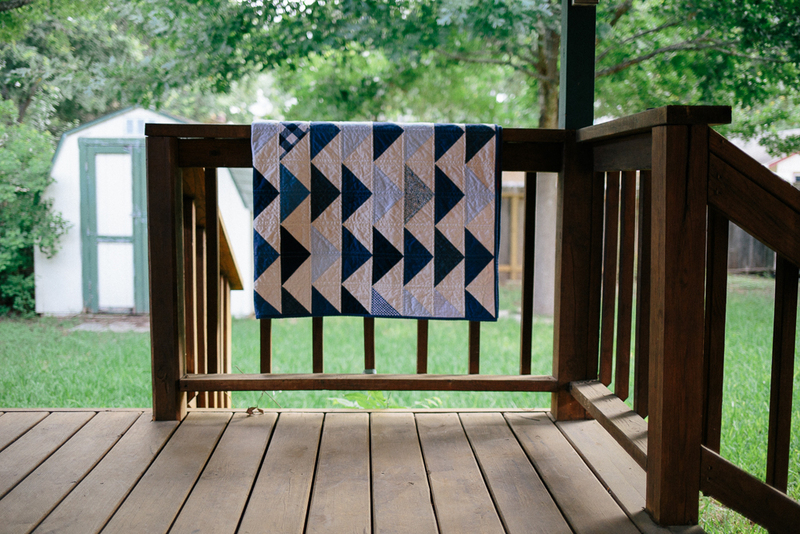 She has such a fresh, modern take on traditional quilt patterns, so I decided to go with her 16-patch Be Squared quilt pattern. Unfortunately, I didn’t consider the fabrics I’d been collecting, which were all dark grays, blues, and neutral creams. I had planned on adding a punch of orange or pink, depending on whether the baby would end up a boy or girl. So I got started on this very tedious pattern, only to realize four months later that the quilt started to look like a giant checkerboard. This has absolutely nothing to do with the quilt pattern, but rather my failure to think about the color palette I had chosen to use in the pattern. It made me a little dizzy each time I walked into the sewing room, and I thought – if it’s this hard on my eyes, how is it going to look to the teeny tiny baby? (Side note: I still have the quilt blocks saved from this quilt, and plan to soften it up by finishing with some soft gray sashing, which I think will really help break up the design). So in September, I made a change of plans and picked a new palette of some of my favorite Kona blues. I ended up settling on several Kona solids, including Cloud, Delft, Navy, Indigo, Windsor, Cadet, and Snow. I also wanted to include some prints in the mix, so I added in two ginghams, an oxford stripe, and a Liberty floral (I couldn’t help myself with the floral). 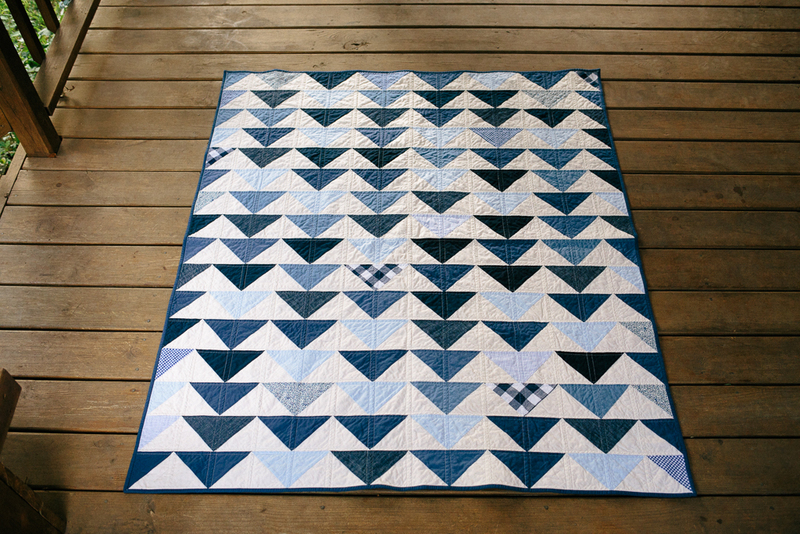 ;) I ended up going with the Flock of Triangles pattern from Denyse Schmidt‘s first book, Denyse Schmidt Quilts. 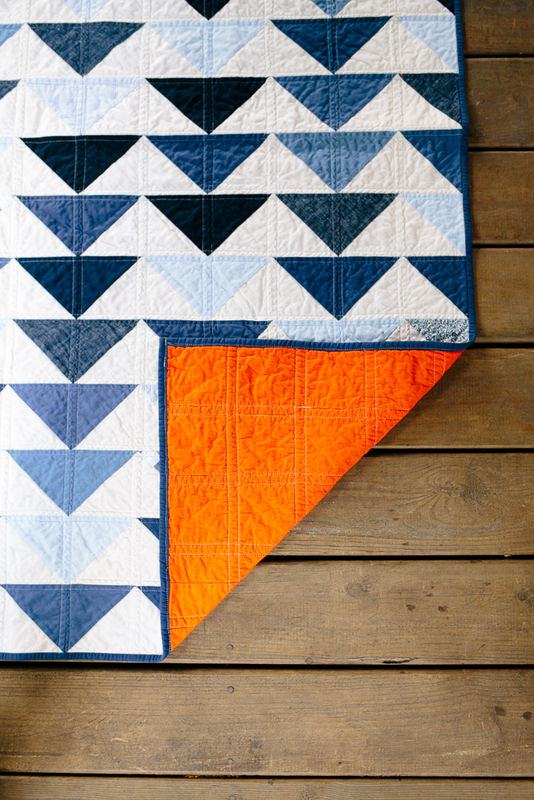 This was my first sewing book, ever, and the orange triangle quilt was one of my favorites from the book, so it only makes sense that I chose the pattern. 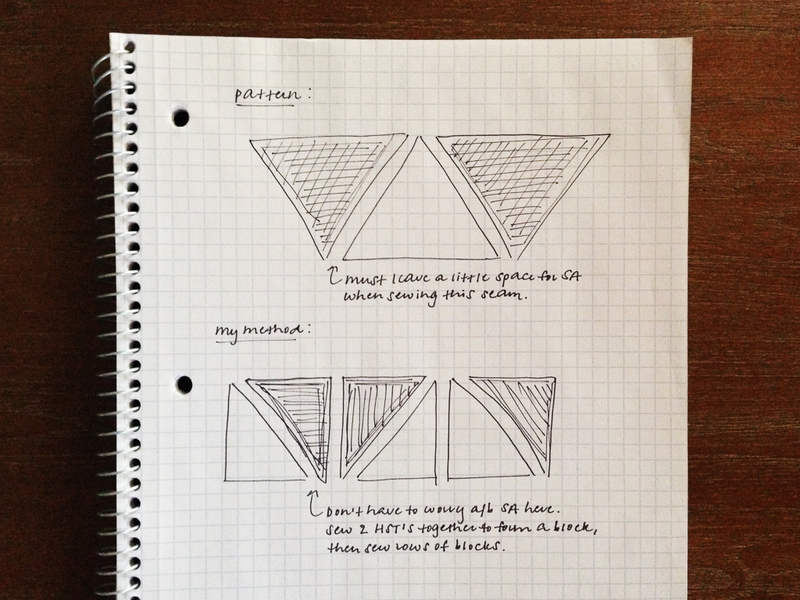 I knew the bold triangles against a white backdrop would be such a fun, simple pattern for this baby to grow up with. I knew from the beginning I wanted to quilt it myself, so I settled on a pretty basic straight-line quilting, about 1/4″ from each seam. The quilting went a lot quicker than I had anticipated (it was my first big quilt project to quilt, even though I’ve done some smaller pillows and bags in the past). I did have a little trouble with the spray baste I used (it was my first time to use spray baste, and after some trouble it gave me with skipped stitches, it will probably be the last). For the binding I referred to Rita’s tutorial on her website, Red Pepper Quilts, which was super easy to follow. (We took these pictures right before nap time – can you tell? This boy is full of expressions!). In the end, I’m really, really happy with how it turned out! 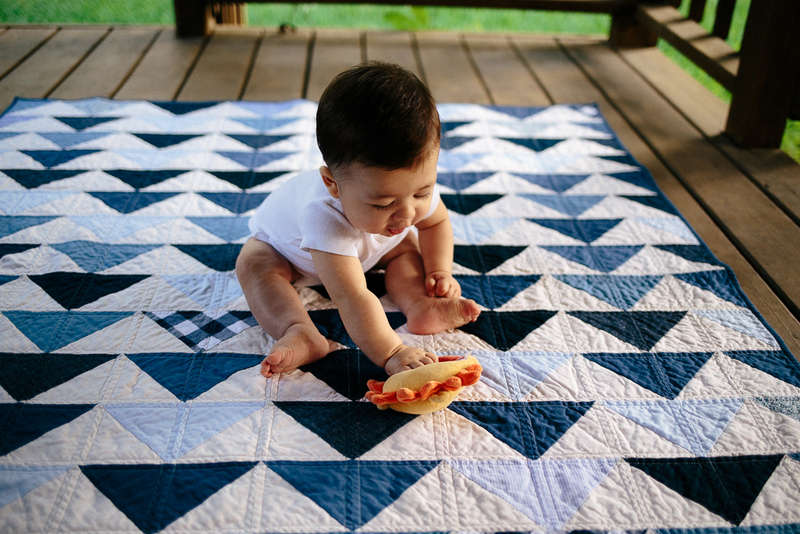 The quilt is not perfect, to say the least, but I love watching Jackson use it and play with it every day. He’s started to play peek-a-boo a lot lately, and loves to hide behind his quilt to play. It just melts my heart!